You know Vlambeer? Of course you do. You killed yourself with a Disc Gun in Super Crate Box dozens of times, while still having lots of fun. Vlambeer consists of two nice guys: Rami Ismail and Jan Willem Nijman. Want to know more about them? Read on! What's your background on making games? How many games have you started/finished before Super Crate Box and Radical Fishing? The both of us are really different. Before we started Vlambeer, Jan Willem was a prolific indie game designer - he made dozens - if not hundred of games. Rami used to work on somewhat longer-term games as a developer and business guy - he has a dozen of games he worked on. We started Vlambeer when we found out our skills complement rather well. What tools/languages are you using (I know it doesn't matter that much, but people always like to know)? Jan Willem prototypes everything in Game Maker, we then take the prototype, discuss it and if its fun and worthwhile to work on, complete the project in whatever language is necessary. Rami uses anything from ActionScript to C++ to get the final game there. For Super Crate Box, we ran out of time prior to the IGF deadline, so instead of porting the prototype, we polished the Game Maker version. What inspired you to make SCB? Or was it just a random idea? 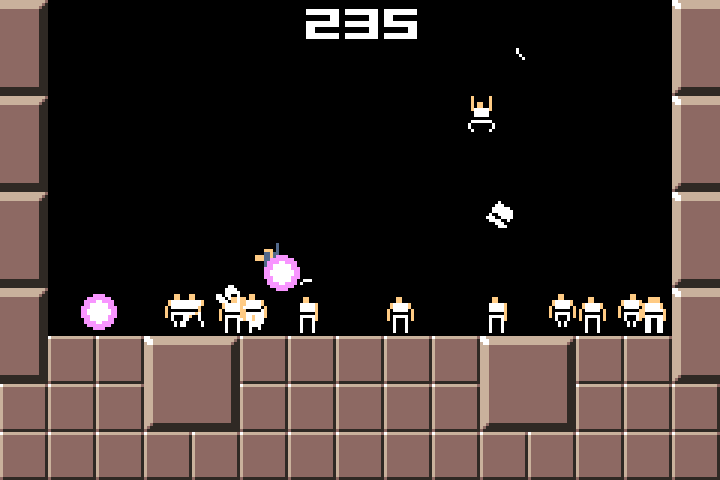 The wish to create a proper platform shooter while trying to get rid of the nonsense in the game design. What was the biggest problem you came across during SCB design/development? There really weren't that many. Super Crate Box was really created on a roll - first by Jan Willem alone every now and then for a few months, then Vlambeer was founded and we finished the game in two months of ultra-hard work. If anything, it was difficult to decide when to call the game done. There were and are so many ideas we still have, some of which that actually were playtested in the prototypes, that didn't make it to the final game. Not really, to be honest. We make money with the Vlambeer Light games - the Flash games and smaller projects we do to fund our main efforts - the games we really want to make - games like Super Crate Box and Serious Sam: The Random Encounter. We do intend to continue working on Super Crate Box in the future, to see whether we can do something with all those ideas we still have. We don't think so, it's really our way of applauding the Bit Collective guys with idea of and the execution of the idea for the WINNITRON - so its a WINNITRON exclusive. On the bright side, there are WINNITRON systems appearing everywhere, with a recent one launching in New Zealand and several systems underway. If someone wants to play Super Crate Box VS, they can visit an existing WINNITRON or build their own by contacting Bit Collective. How the work on Serious Sam: The Random Encounter coming along? Will it be playable for everyone (I mean free download), or bundled with the new SS game, or...? Work is coming along nicely on the game - we just played through the entire first level of the first world. We think it'll be a seperately sold title, though. Please name a few of your all-time favourite games. Jan Willem really enjoys games as Quake, Flywrench and Nikujin - Rami is more of a triple-A gamer and would name games as Deus Ex and Mass Effect. Why are you making games? What do you want to achieve? We have completely different reasons, but we agree that gameplay should be the focal point of games and I think that is what drives us. In the end, though, we think it's just that we want - or as Jan Willem puts it: need - to create stuff. Anything but games. We avoid taking inspiration from other games. Anything from bad sci-fi books to going to the grocery store can be an inspiration for us. We have no clue. We like to believe people thought the broken mechanic was intentional, but we're so happy we fixed it for April 1st. Thanks for taking time to answer my questions! And you, dear readers: be sure to check out their new game, which is a karate-sim done in 2 hours! 0 Response to "Interview with Vlambeer"